Luna Park in Melbourne's bayside suburb of St Kilda, is listed in the Victorian Heritage Register. 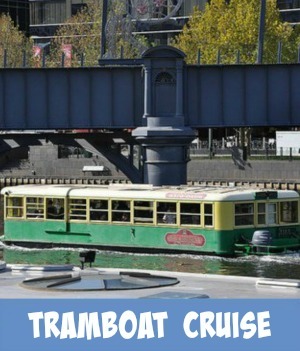 With many of it's old buildings, rides and amusement areas also listed by the National Trust of Australia. There is no way you can miss the Mr Moon face of Luna Park nor the twin towers, at the entrance to the park. The amusement park overlooks Port Phillip Bay. 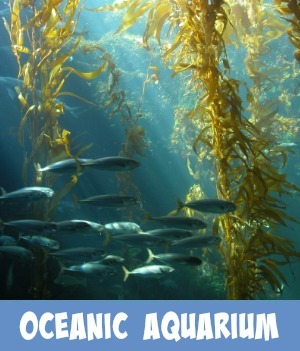 It is easily accessible by public transport. Just walk in through Mr Moon's mouth. Once inside you will find an assortment of attractions to amuse and trill you. All rides are well maintained and safe to enjoy. The historic park opened in 1912 and apart from the period during World War 1, the park has remained open up till this present day. Only 2 out of the original 5 Australian Luna Parks have survived over the years, one in Sydney and the other here in Melbourne. 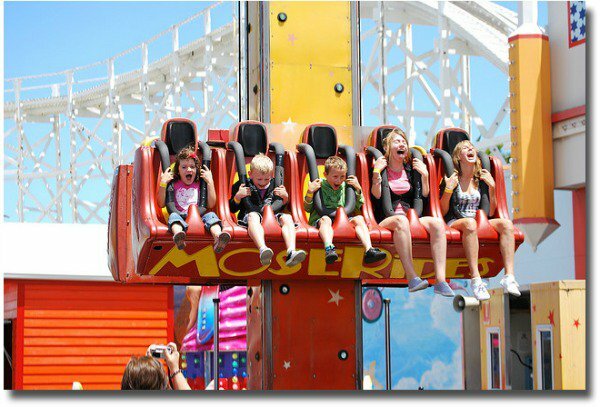 These days thrilling rides delight all age groups and Luna Park provides a great day out for all the family. Where Is Melbourne's Luna Park? When Is Luna Park Melbourne Open? Luna Park Melbourne also is open at certain other times throughout the Melbourne Summer months. Check here for the amusement park's extended open days and times. You can easily reach Luna Park by public transport. Trams No.96/16/3/67 and 79 will take you direct to the entry gates. Check out Melbourne's Public Transport Timetables for more details. Parking can be found close to the park in the council metered parking areas in Beaconsfied Parade, Shakespeare Grove and Cavell Street. Tip: Have some coin on hand as the meters, although they do accept card, sometimes they are a little temperamental. Usually parking will cost you $4:50 per hour or better still if you are spending longer $10:80 for the whole day is very reasonable. 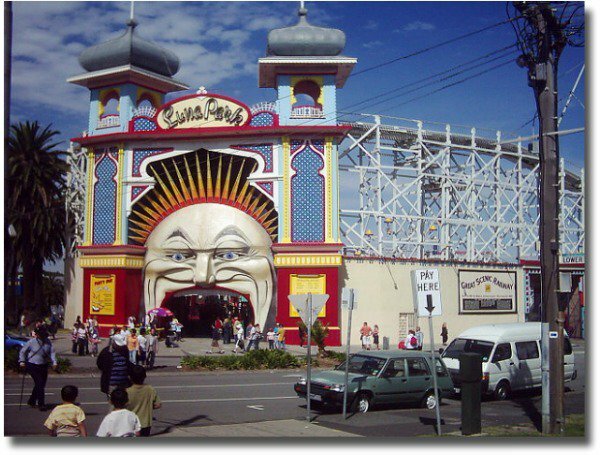 Why not celebrate that special occasion down at Luna Park Melbourne, just for fun! The Enterprize - crazy, fast and furious, defies gravity! To get a great view of Luna Park have you ever considered flying over it? 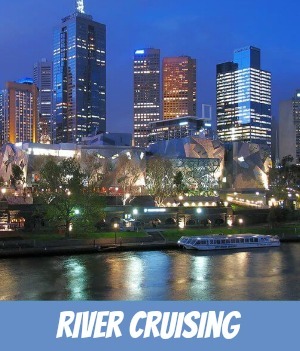 Truly a unique experience, taking in the amusement park and all that surrounds it, along with other areas of Melbourne you perhaps have never seen. 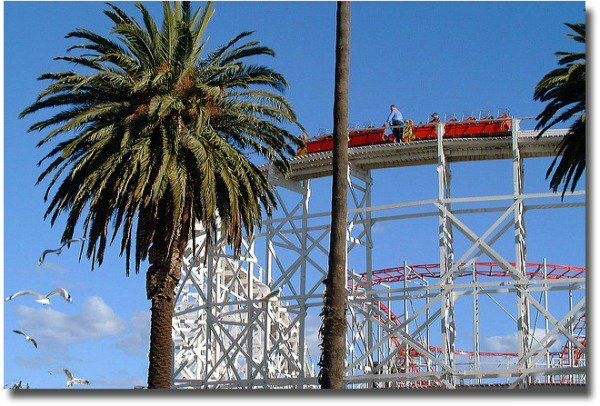 The Scenic Railway roller coaster is a large wooden coaster that travels around the perimeter o Luna park thrilling its passengers as it hurtles up and down and round and round the park. 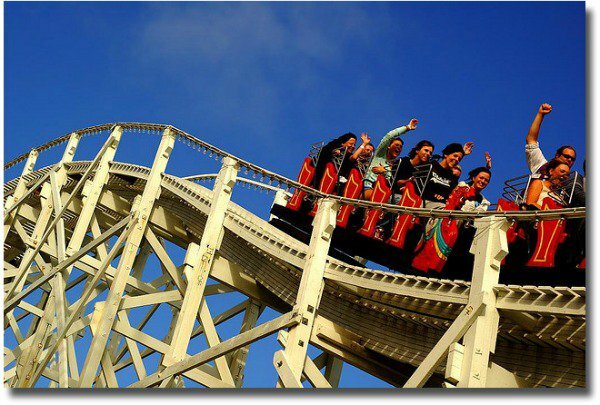 Professing to be the oldest continually operating wooden roller coaster in the world, this ride has to be on top of one of the best things to do in Melbourne. Note that the Luna Park Melbourne roller coaster's main claim to fame is the fact that it has a standing brakeman, who rides the train in control of the carriages. Got A Passion For Amusement Parks? There is something both sad and creepy about an abandoned amusement park. Perhaps its because a place that was once packed with fun seekers has become slowly choked with weeds. This new book series that pays homage to the creative pioneers who have made the world's amusement parks, theme parks, amusement rides and waterparks what they are today. Ripley's Believe It or Not! 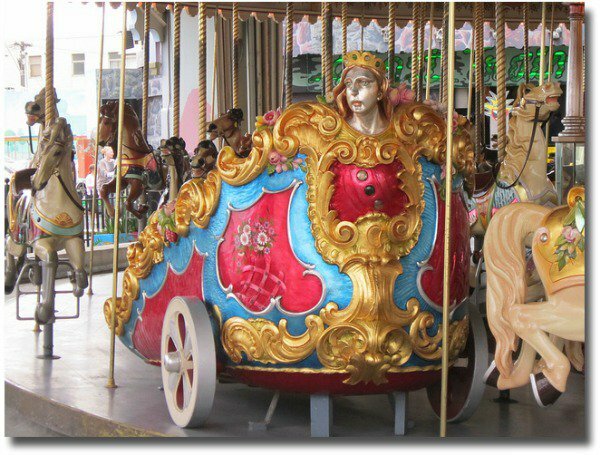 Amusement Park Oddities & Trivia is an uncanny journey through the weird, wacky, and absolutely true world of amusement parks, rides and attractions! Experience The Scenic Railway Here, Right Now - Hold On Tight!